 The theological sense one makes of Constantine the Great reflects deeply on one's other theological commitments. Beyond the painfully simplistic evaluations that Constantine's reign was obviously a regrettable fall or that Constantine really was great, anyone interested in questions of theology, politics, and violence must attend carefully to the sweeping changes that he wrought. 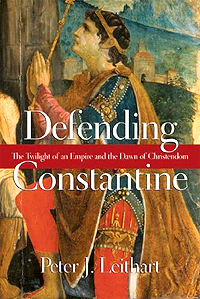 We are all fortunate that a mind like Peter Leithart has taken up the task to tackle these difficult theological questions through his theo-historical argument in Defending Constantine. While Leithart's most specific targets are John Howard Yoder, Stanley Hauerwas, and their "increasing tribe," Leithart's presentation of Constantine has broader implications for our current political milieu where separation of church and state are taken for granted as obvious goods. In short, Leithart challenges Yoder's Constantinian critique. Broadly speaking, Constantinianism is the name for when Christians attempt to make history turn out "right" by grasping the reins of power and become willing to use violence to achieve their goals; such means, Yoder contends, contradict the life and witness of the crucified Lamb. other scholars, Leithart is able to focus on what he really wants to argue about: theology. But, first the historical argument. Leithart does not shirk the tough and obvious questions: Did Constantine really convert? Was he really a Christian or just someone who used the Christian faith to gain power and influence? The latter option is a real possibility because of the failure of preceding emperors to curb the growth of the Church. Leithart shows that Christians "mixed" with other Romans economically, judicially, and militarily. Christians did not "keep to themselves" in a way that would have allowed them clemency from emperors like Diocletian. Leithart rightly notes that the conflict between Christians and Roman leaders was not a conflict of church and state but of conflicting political theologies. Since Constantine served in Diocletian's army and became emperor in the eastern portions of the empire in 306 as part of a disintegrating tetrachy installed by Diocletian, he had leadership experience and firsthand knowledge of how Rome had dealt with Christians. He thought such persecution policies were ineffectual. Hence, Constantine could be read as a political opportunist taking on the mantra, "If you can't beat 'em, join 'em." To the contrary, Leithart concludes that Constantine had a legitimate conversion and thought of himself as a Christian. Leithart does an admirable job sifting through the various accounts of what happened at the Milvian Bridge, the most popular version of which comes from Eusebius of Caesarea. After discussing the evidence, Leithart concludes: "The far more likely conclusion is that Constantine saw something that he took as a divine sign" (73). Hence, Leithart follows Eusebius insofar as he records Constantine seeing a visual sign in the sky noting Constantine's deeply religious life even prior to his conversion to Christianity, a life that included visions. The significance of Constantine's religiosity lies in the fact that in Rome it would be highly unlikely for a general or leader to shift allegiances during a battle or conflict, unless they had a very good reason. This reason was the cross in the sky, which Leithart says was a sun halo, a common phenomenon on a spring afternoon. "In a sun halo, the sun is in the center of the circle and often radiates beams in a cross or asterisk shape" (78). Leithart argues that this helps explain Constantine's repeated use of light and sun imagery, especially solar imagery when referring to Christ. The vision, along with Constantine's refusal to make sacrifice to Jupiter upon becoming Augustus, and the new use of Christian imagery, albeit alongside pagan symbols, on currency provides reasonable grounds for believing in Constantine's vision and conversion, according to Leithart. Given Constantine's success and history, he came to believe that persecution of the Christians was not only a bad idea, but that he should actually promote the Church. Leithart marshals more evidence to corroborate his claim to real conversion in the face of contemporary and ancient critics. He rightly reminds readers that Constantine did not separate faith and politics like we do, and hence to immediately judge Constantine for using faith in political manners is anachronistic. Using faith to promote a political agenda was not necessarily the work of propaganda, although to our minds it nearly always connotes that: faith and politics were intertwined in Rome long before and after Christianity came on the scene. Moreover, Constantine used theological arguments to promote the unity and mission of the Church. Leithart uses Constantine's Oration to the Saints to argue that Constantine wanted to be thought of as a Christian. Leithart even makes use of Constantine's burial to say that Constantine believed himself to be another Christ (alter Christus). While Leithart obviously objects to the truth of such a claim, his point is that only someone deeply committed to Christianity would take on such a title. Leithart concludes: "Constantine thought too highly of himself, but in thinking he could join Christ in crushing Satan [Romans 16], he was simply thinking like a Christian" (94). Constantine's policies, while pro-Christian, were not necessarily persecutions of other religions, Leithart maintains. Constantine granted "limited toleration" of paganism and Judaism and had pagan philosophers in his court years after his conversion. Though Constantine did have troubling policies and rhetoric regarding the Jews, Leithart argues that Constantine basically remained consistent with preceding Roman legislation that allowed Jews to practice faith but not to proselytize. In the end, therefore, Yoder's account that Constantine tried to force Christianity upon the entire empire is false. While everyone in the empire knew Constantine's bias and faith, he did not actively persecute other religions. However, persecution is a tricky word. After all, Constantine did use his authority to promote the Church. Yet, "He did not pretend to establish a neutral religious freedom," as Leithart so wonderfully puts it (112). Arguing directly against Locke's "tyrannical" separation of the civic and religious realms, Leithart finds Constantine's "toleration" unproblematic because there is no such religiously neutral space or policy. Hence, for liberal democrats, like nearly all Americans (Democrat and Republican), we inevitably see this as persecution, despite Leithart's warning. To his accusers, Leithart would simply argue, and rightly so in my opinion, that the conflict is not one of church and state but one of conflicting political theologies. Like Locke, liberals have a political theology and it goes under the guise of putatively claiming not to have one insofar as it positions every religion and keeps it out of the public sphere. Here, Leithart agrees with Yoder, Hauerwas, and Milbank, that the church is essentially a public and political community. Eventually, subsequent emperors abandoned Constantine's policy when pagans and Jews came under direct attack late in the late 4th and early 5th centuries. Thus, Leithart reads Constantine as the solution and not the problem; his policies might have made such persecutions possible, but nothing about such an institution made them necessary. Later emperors wrongly went beyond Constantine. Leithart also shows that Constantine did not simply use the Church and its bishops to serve his own imperial interests. Leithart illuminates the council of Nicea by demonstrating the new complexities that bishops and the Church were learning to negotiate vis-à-vis a Christian emperor. With his usual keenness, Leithart says, "...emperors have no right to define orthodoxy. The question is, did Constantine do that?" (151). Challenging Jacob Burkhardt, Leithart argues that while Constantine did have a kind of final authority over the Church, such authority was far from absolute. Again, the 4th century context demands such a set up according to Leithart. For starters, Constantine did not take a place at Nicea until invited. Since controversy was rising, Constantine asked the Church to deal with the Arian issue, but he did not unilaterally convene and impose his will at the council. In fact, such deference to ecclesiastical authority had precedent. When Donatists bypassed bishops and appealed to Constantine directly, Constantine deflected authority to bishops meeting in Rome. Constantine did eventually intervene and persecute the Dontatists, but only after councils failed to adequately deal with the controversy. Leithart makes the case that Constantine learned from the Donatist controversy not to persecute the Arians. He says that Constantine "pleads" with bishops to get along and find a way to unite Arians and pro-Nicenes. In this way, one sees a Constantine who sought to allow bishops to exercise their ecclesial authority and find solutions on their own. Moreover, there are examples, like Athanasius, of bishops who outright defied Constantine (and his successor). Likewise, Hilary of Poitiers wrote letters to correct Constantine's son, Constantius. Such battles show that power was not solely on one side or at least recognized to be solely on one side. The Church did not simply cave to Constantine and imperial power. Constantine's domestic policies also witness to his Christian conviction. In 325, he ended the violent gladiatorial shows that Leithart fascinatingly shows were another form of sacrifice in Roman culture. Furthermore, Constantine increased punishment for sexual crimes, including the death penalty for rapists and he "improved the lot of women in the empire" (204). He ended legal deprivations for the celibate, childless couples, and women, engendering a new form of masculinity that was no longer defined by sexual prowess, battle victories, and political power as in historic Roman culture. Thinking sexuality not merely a private affair, Constantine implemented laws that promoted sexual self-control. Beyond sexuality, Constantine also sought to rectify laws that neglected or preyed upon the poor. He decreased appeals fees so the poor could have their cases heard, and he threatened to punish, at times with death, governors and magistrates who failed to hear cases in a timely and just manner. Trials also became public and Constantine asked the public to praise the most just judges. Constantine also allowed civil appeals to be heard in ecclesiastical court, since bishops were less likely to be bribed or bend to the powerful. Here, Leithart praises Constantine's conservativism that sought to simplify the corrupt and bureaucratic judicial system that oppressed the lower classes. Likewise, Constantine helped the plight of children and slaves. He undermined the basis of child exposure and offered imperial aid to parents to prevent them from exposing or selling their children. While Constantine did not abolish slavery, he did seek to ameliorate their conditions by seeking to keep slave families together and issued laws that enabled new avenues for their freedom, including manumission within the Church. Constantine praised the release of slaves as an act of piety that pleased God. He also banned the killing of slaves by owners and allowed for their trial as murderers should they do so. By these accounts, Leithart argues that Constantine's rule was not an awful fall from Christian orthodoxy, but instead allowed certain advances in justice and charity throughout the empire. I have chosen to focus on the more positive side of Constantine's rule because Leithart does so. Constantine does not escape unscathed, however. Leithart frequently criticizes him for his impatience, arrogance, and errors in judgment. He also does not forego a discussion of the circumstances surrounding Constantine's ordering of the execution of his wife, Fausta, and son, Crispus. Constantine could be brutal, and Leithart says as much. However, Leithart highlights a lesser-known side of Constantine, thereby creating a wonderfully complex and more accurate portrayal of events and life in the 4th century. Before moving to a direct discussion of Yoder's theology, Leithart argues that the early church, pace Yoder, was not mainly pacifist. To counter Yoder, Leithart seeks only to show the diversity of Christian views and approaches up through Constantine's reign. As early as the 2nd century there are inscriptions of tombs display that there were Christian soldiers. Leithart even perceptively uses Tertullian, one of the most vehement anti-war Christians, to his aid. Leithart suggests that Tertullian's strong rhetoric indicates that he was dealing with Christians entering or considering entering the military. Perhaps most importantly, Tertullian's objection to Christians in the military taking communion implies baptized Christian soldiers were communicants. Leithart argues that Christians did participate in the military and those who objected to doing so objected for differing reasons. Some, like Tertullian, cited imitatio Christi, and others, like Origen, limited Christian involvement, while encouraging Christians to pray for the emperor and the success of his battles. In sum, history does not bear out Yoder's pacifist reading, unless the Constantine heresy began very early—so early that one wonders if Jesus was ever understood. We are in Leithart's debt for his insightful historical survey and summary. After such a rich historical summary and exposition, surprising disappointment struck when Leithart turned exclusive attention to Yoder's theology. The final chapter is the weakest part of Leithart's argument and overall splendid book. My concerns amount to an imprecision and several missteps in his reading of Yoder and Hauerwas. One imprecision in Leithart's argument revolves around his account of Yoder. Leithart rightly understands the essential eschatological impulse of Yoder's pacificism and theology. Leithart understands that Yoder's historical thesis is theological, but fails to see (or grant) the more radical theological point: theology logically precedes historical inquiry for Yoder. In short, Yoder, rightly I think, understood that every historical narration implies a theology. Yoder is just more explicit about the normative theological claims that animate and structure his historical argument. I actually think Leithart understands this, yet ambiguity remains. I do not judge this to be an error insofar as ambiguity seems the most accurate description, but more importantly because Leithart's overall case against Yoder remains unaffected. Regardless of the claim about theology's relationship to history, I think both Yoder and Leithart know they cannot and should not "fudge" history. Just because history rests on non-historical grounds does not mean that anything goes. However, when Leithart implies that we must get our history right before we do theology, I think he misreads Yoder, since Yoder learned from Barth that theology is first philosophy (see e.g. p. 267). At the very least, he should engage Yoder on this theological level instead of presume Yoder's error. Again, in my estimation, this does not require Yoder (or anyone) to be "fideist" and dismiss rigorous historical inquiry; only that theology is held accountable by the task of history even as theology structures it. I think Leithart has done an outstanding job of holding Yoder's theology accountable to historical inquiry. Therefore, and despite this theological imprecision, Leithart's main point that Yoder's theology comes under judgment when it fails to account for all the complexity of the Constantinian shift obtains and has serious merit. Always the rhetorician, and usually in delightful ways, Leithart sometimes overly indulges himself. For example, after narrating his theological politics from Scripture's own development from the OT to the NT, Leithart avers "...unless one follows an almost Marcionite contrast of Old and New, the Old Testament remains normative for Christians. Though it is normative in a new covenant context, it is impossible to escape the fact Yahweh carried out his wars through an Israel armed with swords, spears, and smooth stones" (335-336). Leithart certainly knows how to raise the stakes. Leithart directly implies that Yoder's (or any pacifist for that matter) reading of the Old and New Testaments is Marcionite and therefore heretical. However, he glosses over the really important theological question, at least in this theologian's mind, that he alludes to: What does the normativity of the "old" covenant mean in the context of the new covenant? This is the question where he and Yoder disagree, not on the authority of the Old Testament; unsurprisingly Leithart musters no evidence that Yoder is seeking to deny the OT's authority. As a result, Leithart slants the rhetoric into his favor so severely that disagreement with him implies heresy. I think this both an unfair reading of Yoder and an unnecessary rhetorical posture to assume. To be fair, Yoder does call Constantinianism a heresy, so Leithart simply continues the rhetorical flare of his interlocutor. I object to Yoder's original excess, along with Leithart's extension of such rhetoric. Leithart makes a frustrating, albeit common, error when he implies that pacificism equals passivity. Nothing could be further from the truth. I have no idea how one, especially of Leithart's intellectual prowess, could draw such an erroneous conclusion from Yoder and especially Hauerwas. Leithart begins by relating the OT to the NT, "The point is that the story of Scripture is not a story of increasing passivity but of increasing participation in the activity of the ever-active God" (336). Fair enough. But then he goes on to ask this rhetorical question: "Is there something unique about Jesus' death that demands his unresisting passivity?" (337). By putting matters this way, Leithart implies that Yoder's pacifist reading of the OT and Jesus' life and death requires passivity. In short, that pacifism equals doing nothing. Leithart never actually goes this far, but the language he uses certainly invites such a conclusion. I think this error reveals Leithart's own theological proposal more than it sheds light on Yoder. Unfortunately, Leithart does imply the equation of passivity with pacifism comes from Yoder and Hauerwas. Leithart fails to address an important aspect of Yoder's reading of Scripture because Yoder's pacifist reading comes not only from Christ's own action, but also from the NT's condemnation of those responsible for Jesus' crucifixion and their use of power, violence, and death. The identification of pacificism with passivity also obscures the NT witness' own judgment on Christ's crucifixion, which Yoder draws upon and Leithart does not mention. At the end, I am also left wondering: Who is this argument for? The influence of Yoder and Hauerwas on younger theologians clearly concerns Leithart. (Interestingly, Hauerwas gets named on occasion, but his work is never substantively addressed). Is this book simply for them? If so, I wonder if he has granted them more influence than they actually possess. Do non-liberal Christian pacifists (or any pacifist for that matter) really occupy a position of power in our culture or in churches? I doubt it. However, his central attention to Yoder makes his argument appear more provincial than necessary. From my perspective, I would think making the case that Leithart wants to make would be more effective if he more explicitly attacked contemporary versions of liberal politics that are glaringly inattentive to the complex history he so articulately narrates. As mentioned above, Leithart does soundly criticize the liberalism that comes from Locke, but I think thematizing it would prove a more theologically germane task than a focus on Yoder. Given the current ecclesial conditions in America, I would be thrilled to have throngs of Yoder's (and Hauerwas's) followers filling the ranks of the church in the United States, and I am no Yoderian. In this way, I pray that Leithart's argument proves prescient. No matter what the future holds for the church, Leithart's book deserves serious attention by all theologians and ethicists interested in the church's relationship to the state. Timothy J. Furry is a doctoral candidate in theology and adjunct instructor in the Philosophy and Religious Studies departments at the University of Dayton, Dayton, Ohio.